Choice is one of the great benefits of online education. Why should bright, young people choose eIMACS to learn university-level mathematics or computer science? We'll let university professors, current and former students, parents, and reviewers explain in their own words the unique opportunity and advantages that our courses have to offer. "We have here at Harvard a young man who came out of the IMACS program. He was able to begin his mathematical studies at a very advanced level by taking a course usually taken by juniors and seniors, and he has been a straight A student. Our program in mathematics is the strongest in the nation and for him to be able to jump in with our best students and perform at the highest level is ample testimony of the strength of the program." "I have personally examined some of the teaching concepts and materials that have been developed by IMACS. I have determined that they are of outstanding quality." "I believe the IMACS Computer Science course could revolutionize the way computing is taught at the high school level and, more importantly, excite many of our best minds to a study of computer science." "It is my considered opinion that the IMACS curriculum does a wonderful job of captivating young minds and provoking within them a lifelong thirst for learning, particularly in the areas of mathematics and computer science. IMACS produces graduates with unusually mature insight into mathematics ... These are students that university mathematics departments recruit like star quarterbacks." "I cannot speak too highly of the IMACS curriculum. The content and the pedagogy are of the highest quality and I recommend it without reservation." "I just finished my first year as a math major at Yale, and I wanted to write to give you an update, and to thank you for the preparation for college the IMACS way of thinking has given me ... When it came time for the first problem set to be turned in, I suddenly found that everybody in my dorm was asking me questions about problems that seemed to me to be as routine as filling out a form. I remember asking myself how anybody learns what a proof is without learning the IMACS way." 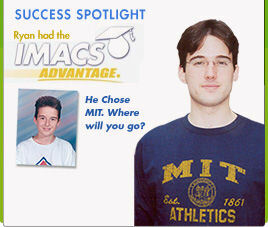 "I cannot thank IMACS enough for being an integral part of my admission to MIT. IMACS helped shape my dreams and goals in many ways and was where I fell in love with programming. The first online resource I always strongly recommend to high school students who are interested in math and computer science is eIMACS. Those courses set a firm base for my programming knowledge and turned out to be only too valuable during college." "The IMACS classes I took (LM1 and LM2) were very helpful to me for the proofs and logic exercises which were a big part of my math and computer science classes at Stanford. I had a leg up and already knew a number of topics covered in my classes. And they were lots of fun too!" 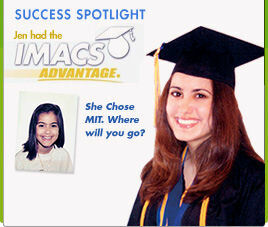 "IMACS has given me huge advantages over my college classmates in math and computer science. During my first semester at RIT, I took Discrete Math and Intro to Proofs. Nearly everything that was taught in that class, I had seen before in the eIMACS logic courses. On the first test, the class average was in the low 70's, but I got a 104 because my professor awarded me bonus points for exceptional work. The course has a reputation for weeding people out of the applied math program, but I easily got an A thanks to my IMACS background. Taking the eIMACS Java course enabled me to get a 5 on the AP Computer Science A exam in my junior year of high school. That, in turn, earned me a spot in a Java programming class at RIT that most applied math majors never take. Thanks to IMACS, I was already familiar with several topics covered in the course. I was one of the best students in the class despite being the only one who wasn't majoring in computer science or software engineering. I am truly grateful for the advantages I gained at IMACS." "As a professional software architect I can't say nearly enough about the computer science education I received from IMACS. Every topic in my computer science degree came easily thanks to my IMACS background. They prepared me not only as a very well versed computer programmer but also as a strong problem solver. I actively look for the same problem solving skills that I learned at IMACS when hiring. The concepts I learned at IMACS have translated to every programming language I have taught myself, and I am eternally grateful for everything they taught me." "I recently completed the eIMACS AP Computer Science course. Before taking this course, I had a minimal background in computer science. After completing the course, I feel that I have attained a strong background in CS and have discovered a passion for solving problems by coding. My experience with eIMACS was amazing! The class material was well-written and easy to understand. If I ever had a question, I could easily access my eIMACS instructor. The lab assignments were challenging but fun and interesting. They provided me with real opportunities to learn how to code. Throughout the year, I have learned not only how to code, but how to think. This class has strongly influenced my interests. This summer I will continue my studies at Google in Seattle, and I plan on studying CS at Brown University in the fall. I can't thank eIMACS enough for helping me to realize how exciting, interesting, and multifaceted computer science can be." "There is no doubt that the IMACS curriculum gave me the logical thinking skills and mental framework that inspired and enabled me to develop the Chocolate Fix puzzle system." "At a very young age, I began to get bored with the pace of the math curriculum at school. IMACS provided all the enrichment I could hope for and more. The unique coursework gave me the foundation in logical thinking that allowed me to place into a math class four years above grade-level. The University Computer Science curriculum did much more than teach me how to code; it taught me the process of structuring a program. No matter what computer language I am programming in, a quick reference to the general language structure is all I need to adapt. As a girl, I am a minority in the world of computer science and engineering. In a male-dominated field, the IMACS curriculum gives me the advantage I need to be successful in high school, college, and the workforce." "Before IMACS, I did not realize how interesting and exciting mathematics could be. It taught me advanced thinking skills that helped me succeed in all my math classes and even in my general studies." "Honestly speaking, this course was maybe the most well-designed one I've taken. It wasn't very hard to follow any of the material in any part of the course. The course didn't just meet my expectations, it exceeded them. For anyone looking to start off in computer science I would definitely recommend this as the beginning step. And if the rest of the courses eIMACS has to offer are of the same or greater standard, they should be excellent." "Overall I was very satisfied with my eIMACS experience. The eIMACS set-up of the APCS course was the most intuitive and easy easiest to follow of all the online computer science-related courses I have taken. My instructor was always prompt and clear in his responses, and the course material was detailed and challenging, while the tests and assignments were at the right level. The free response questions were different and distinct enough from the rest of the course material and helped me to score a 5 on the AP exam. The course boosted my interest in computer science and came in especially useful during the camp I attended this summer working where I worked on programming mobile apps." "I wanted to say that I'm taking my first CS and EE course here at Harvard. In CS I was able to skip the intro course and so the first language I'm working with is LISP, which I am loving since it is so similar to Scheme. I've been doing very well on assignments and I'm really liking the experience I'm getting..."
"IMACS is an amazing program that emphasizes logic-based problem solving and critical thinking skills. Its innovative curriculum is ingeniously woven into fun games and puzzles, and gives a rock-solid foundation in critical thinking and logic. I've taken almost all of their logic, computer science, and math enrichment classes. The quality of their courses is outstanding and, in my experience, unique. I always looked forward to my weekly IMACS sessions and online eIMACS courses. Thanks to IMACS, I had the logical and conceptual foundation to thrive in college mathematics and computer science courses at Carnegie Mellon and Stanford as a high school freshman!" "My first CS class at Virginia Tech was a breeze compared to the material that IMACS covered when I was much younger...I can't thank you and the other IMACS instructors enough. I hadn't realized how much you had taught me. You had always told me that I knew much more material than I realized, but I never really believed you — until now!" "IMACS programming courses are great for teaching computer science at both a beginning and more advanced level. They've helped me so much in learning how to code and in understanding deeper concepts. I'm sure the skills I've gained will be very valuable in my future job as an engineer. Thanks to IMACS and its great teachers, I am now learning my fourth programming language! As a girl, I want to encourage other girls to join IMACS and discover programming as a long-term interest. Computer science is not usually offered in middle schools, making IMACS a wonderful addition to any student's course load. With the help of these courses, I plan to contribute to shaping the future of technology." "By age 13, I had completed all the CS courses available through my online high school and regional talent search program. Still, I wanted more and found it with University Computer Science I from eIMACS. The course provided just the right level of challenge to keep me interested every day. Because it is self-paced, I was able to spend more time on topics when I needed or wanted to. My cool online instructor was very supportive, answered all my questions quickly, and even followed up with me by phone to make sure I was 'getting it.' The curriculum helped me think more logically about computing instead of dealing with programming issues by brute force. After UCS1, other CS courses were more fun! I am now 15 and a full-time, dually enrolled university student. As someone who's mostly been in an online learning environment since age 5, I can definitely say eIMACS courses are excellent. Thank you, IMACS, for a solid foundation!" "The summer before my sophomore year of high school, I decided that I wanted to try computer science and took the eIMACS University Computer Science I course. I could not have made a better choice. The class was challenging but accessible, teaching me the fundamental concepts without discouraging me with an extremely complicated language. This helped me to enjoy the ideas and problem solving aspects of computer science without getting bogged down by a frustrating language. It helped instill in me a love of the larger themes, which proved to be exceedingly helpful when I took AP Computer Science in the much more complicated language of Java. Because I had the background of UCS1, I was able to overcome the particular nature of the programming language and focus on the more exciting concepts of computer science. This allowed me to earn a 5 on the AP exam without ever having stepped inside a classroom. I highly recommend both the UCS1 and AP Computer Science: Java Programming courses from eIMACS." "IMACS followed by Indiana University has proven to be an incredible winning combination! Ryan's IMACS accomplishments attracted the attention of Dan Friedman at IU, who in turn stated a number of rather fantastic things IU could do for Ryan if he went there. It took three years to prove Friedman's last and most important representation — that if Ryan impressed certain professors at IU, he could get into any school for his CS PhD. Well, that certainly proved to be true! He has been accepted by Harvard, Princeton, Yale, MIT, Carnegie-Mellon, Brown, Stanford, Cornell, Michigan, Northeastern, Indiana University and Illinois!" "Gifted children need more than they learn in school … and your program is outstanding for those that need that extra learning and challenges. I am not surprised that many of your alumni have gone on to be a success." 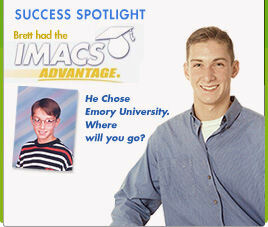 "At eIMACS, our son found an environment conducive to learning, with self-paced and intensive university-level computer science courses offering the depth and rigor he enjoys. Each course is backed by responsive instructors and offers relevant learning that is at once practical and lays the foundation to a strong CS background. As parents, we definitely recommend eIMACS for kids who love computer science, have an aptitude for hard work and enjoy challenging courses different from the norm!" "My daughter has just completed the university level computer science courses I and II offered by IMACS and received A+ grades. My decision to ask her take the first CS course has turned out to be pivotal as she has fallen in love with computing and algorithms and has decided to be a CS major in college. As a parent and computer scientist, I can attest to both the breadth and depth of the problems in IMACS courses. These courses will be loved by students who are self-directed learners and creative problem solvers who love new challenges every day and are able to work with minimal supervision. The courses are very systematically organized, with numerous interactive problems that teach foundational concepts followed by their applications. Parents can also track progress. The instructors are very timely in offering help and in a manner that forces students to think critically in approaching the problems so as to improve their problem solving abilities. In sum, my daughter has got the conceptual and theoretical foundations for a successful college track in CS. After completing the IMACS CS courses, she found the high school CS course sequence (CS Honors with JAVA, AP CS etc.) very easy and not surprisingly got the 'Best CS Student' award. Most impressive was the fact she was easily able to grasp the differences and similarities in various programming languages because of her ability to see through the syntactical aspects and understand the deeper conceptual and semantic foundations that lie at the core of the 'science of computing'." "We have always been very pleased with the local IMACS instructors that our son has had, but the level of commitment from his eIMACS instructor has been outstanding. Our son is a very gifted student with a big heart and wonderful mind, but we know that your program has played a significant role in all of his achievements. His dream is to attend Stanford or MIT to study Computer Science, and allowing him to be part of eIMACS is the best preparation we can provide for him today. We highly recommend IMACS to all of our friends and family." "The eIMACS online courses are excellent for gifted and talented math students. eIMACS did a great job of teaching my daughter mathematical logic. I can't stress enough how valuable it is for our brightest youngsters to learn a breadth of mathematics utterly beyond the usual high-school curriculum, instead of rushing through an honors high-school math curriculum and the Calculus as fast as possible. I was thoroughly impressed by the quality of the materials, and by the speed and quality of the personal feedback in the math courses." "As a parent, I enthusiastically recommend eIMACS. My son has taken all of the CS courses that eIMACS offers (University Computer Science I & II, and APCS) and had a positive experience with each course. After the thorough preparation, he reported that he felt quite confident during the AP exam, and scored a 5. We have been so pleased that we were directed to eIMACS by a (computer scientist) friend who also has a gifted child. I wanted to find a learning environment that fits with an advanced student who learns and integrates quickly, so that our son could move at his own pace. eIMACS was exactly that place. The courses were well presented, and we knew he was in good hands with the instructors. They were remarkably available, responding often within minutes. I particularly appreciated that the instructors did not just answer my son's questions; they redirected my son's thinking, gave him hints, so that he could stretch himself and figure it out on his own. My son loved the courses so much he often had a hard time stopping. It is clear to me that he now has a very strong foundation, and takes away not only specific learning, but also an approach to computer science and problem-solving and that will serve him for years to come. I am deeply grateful for what eIMACS has given my son." "My son took IMACS University Computer Science I as his first computer course in high school. He is now majoring in computer engineering and enjoying an internship as a software developer. He appreciated the course for its good scope, good pace, and good introduction to computer science. I am thankful to his instructor for being so accessible and for providing a great balance of support and challenge. My son enjoyed the course because the learning process was much like puzzle-solving. If I could go back in time, I would have enrolled him in additional IMACS courses earlier on." "My daughter is a senior in high school and completed University Computer Science I this year. She had no computer science experience prior to this course. She felt the material was clearly presented and the exercises were helpful. When she needed assistance, the instructor provided just the right level of help, and his response was almost always immediate. Overall, she feels she learned a lot and really enjoyed the course. As a result, she is considering majoring in computer science in college. As a parent, I can say this was money well spent." "My son began IMACS at an early age and continued steadily for eight years without a gap. He is currently in 11th grade and taking six AP courses. I believe that IMACS provided him with the environment to expand and test his abilities. He was very motivated by the challenges. His IMACS math and computer science courses pushed him and trained him to think in new ways not found in a normal school classroom. He is a very successful math competitor for his private high school and has ranked 1st place in multiple state and national competitions. At IMACS, he was also around likeminded children whom he could talk to and learn with. I am just so grateful to live near a program that was able to broaden my son's horizons and give him an advantage he may not have otherwise had. Thank you IMACS!!" "IMACS was the first time our daughter had encountered a community of teachers and learners who were excited to hear her ideas and creative ways of problem solving. She loved the Hi-Tech Summer Camp so much that she didn't want to take a week off! She excelled in the computer programming classes and felt that the AP Computer Science exam was easier than the eIMACS course. IMACS prepared her well for the challenges in which she is now engaged, including a university program in math. We are grateful to IMACS for all of the encouragement and challenges they have given and continue to give our daughter." "Our son was an IMACS student from 8th through 10th grade. Because of his radical acceleration in school and in math in particular, he needed early access to more than what was available at middle and high school. 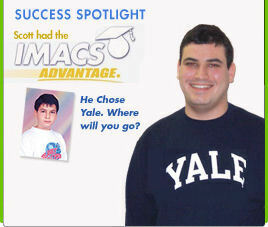 eIMACS allowed him to take advanced classes without the prejudice of age or grade-level expectations. eIMACS provided our son with rigorous classes in programming and logic in a flexible, self-paced manner in the comfort of our home. The Web-based interface and self-contained compilers were bug free, allowing him to concentrate on learning. The online instructors gave prompt and encouraging feedback. Our son is now a high school senior and applying to top math and science universities across the country. Thank you, IMACS, for giving him a firm foundation!" "When we began searching for a way to supplement Cari's math curriculum we wanted a program that did more than just accelerate the standard math courses. Other programs do not provide a rigorous foundation based on logic that is necessary to develop the abstract reasoning critical to understanding the foundations of mathematics. Once we saw the unique approach of your program it made more sense for her than any other we found." "We originally enrolled our son in eIMACS because my husband had studied the math curriculum as a middle school student and had only positive things to say about it. We are extremely happy we did! After taking University Computer Science I, our son decided he would definitely like to add a computer science degree to his major in college when he goes. He found a love and passion for programming that he did not have before eIMACS. The puzzles from the Logic for Mathematics courses are still his favorite math problems of all time. For both the computer science and logic courses, the IMACS instructor was excellent and provided quick and informative answers to all of his questions. Our son has taken many other online and in-person courses over the years, but eIMACS has been the best for the amount of support you get and the unique balance of making extremely challenging work fun and engaging." "We are a family of homeschoolers living overseas. When our daughter became interested in taking computer science classes, we did a comparison among the many online courses and chose eIMACS. We never regretted it! Our daughter had the most enjoyable experience learning from teachers who were friendly, encouraging, and always there to answer her questions. We believe IMACS played an important role in her acceptance into several prestigious universities, including MIT where she will be enrolled. IMACS and eIMACS are well above the competition. We highly recommend them without reservation to anyone interested in computer science or high-level mathematics. This is a program run by generous and dedicated people who are working diligently to provide an excellent education for their students. We are grateful to IMACS and honored to have made the acquaintance of such caring teachers." "IMACS creates a uniquely fun and challenging experience for gifted students through their innovative curriculum and supportive staff. It has been an essential component of the education program for our children." "My son begged me to register him for online computer science classes over a two year period. I was hesitant to take the plunge because classes are expensive and I was unsure if an online approach would be a good fit. After much research into online schools, I registered my son for University Computer Science I, IMACS' college-level intro to computer science class. My son's class more than surpassed our expectations. We were amazed by the quality and depth of the course material and the support of the faculty. My son went on to take University Computer Science II, then the AP Computer Science class as well as their Intro to Logic I class. These classes are rigorous and thoroughly prepare students for advanced studies in computer science. If you are holding back registering your student in these classes due to fears that these classes will not provide an in-depth exposure to college level computer science, I can vouch that the education my son has received at IMACS has been of exceptional quality and well worth the expense." "I would highly recommend the IMACS course for any child wanting to study for the APCS exam. I searched a lot before choosing IMACS and am very happy with the decision. This was the only online APCS course that I found which implemented the new labs. My husband and I are software engineers and found the quality of the course material to be very high. Concepts were very well-explained without talking down to the student. The text format makes it easy for a student to go ahead rather than in a video where some back and forth is needed to go faster. Our daughter pretty much studied it by herself and only needed an occasional reminder when stuck to get help from her IMACS instructor who replied promptly. As a parent, I liked being able to navigate through the online syllabus to see how much was done and what is coming up. The weekly email progress updates were useful too. Our daughter could not study APCS in 10th grade at school, and IMACS APCS was the perfect solution. She got a good foundation in Computer Science principles and programming and also a score of 5 in the AP exam. Thank you IMACS." "I wanted to let you know some good news that I think is a great reflection on the power of IMACS. Ricky recently participated in the MathCounts competition for grades 6-8. Although he is only in 6th grade, he won his regional competition! We are going to the state competition later this month. I feel confident that IMACS played a major role in his success. His math teacher said that she expects he will make it to Nationals when he is in 8th grade. THANK YOU!!!" "As a very young student, my son took three years of on-site IMACS math and logic as well as their summer programs — both excellent programs. I believe that the material and thinking strategies taught at IMACS set him up to enjoy and succeed at all the math and science classes he encountered often with multiple year accelerations. Several years later when he was looking for a strong Computer Science class, we turned again to IMACS. We were sold on the idea that, unlike a CS course that focused on a particular language, University Computer Science I introduces fundamental concepts that would translate to current and future CS languages. It provided challenging and interesting material with exercises that at once taught problem-solving tools, and at the same time, made room for the student to use original strategies to reach successful conclusions. I am also very impressed with the instructor support provided. My son's instructor committed to quick response times (within a few hours) and never disappointed. In fact, most of the time, his questions were answered within the hour. Moreover, the assistance given encouraged him to think, review and problem-solve for himself rather than simply giving away answers. Another invaluable skill for any student! My son is looking forward to taking APCS next year and USC2 if he can squeeze it in, as well as the Advanced Mathematical Logic courses during his senior year. Our only regret is that he didn't start eIMACS sooner!" "My son took Logic for Mathematics I and University Computer Science I online when he was 11 years old. We were pleasantly surprised when we learned that he scored a 5 on the AP Computer Science exam. This 5 indicates the solid foundation he got from UCS1. Thank you for opening the course for him in spite of his age. It has made a positive impact on his academic school life, and for that we are thankful to eIMACS." "Math Monster did eIMACS, and really liked it. He told me, 'after I did the [other] algebra class, I was wondering if I still liked math. Now that I'm doing eIMACS, it has restored me!'" "Upon reading the logic course, I quickly noticed it is written very well, is very comprehensive and detailed. ... This mathematics curriculum provides a gifted child some true mathematical substance, not just your usual school math one year ahead of others." eIMACS was named as one of the top 10 virtual schools and academic programs to cater to gifted students.